Need some help picking your first stock? Follow these seven simple steps. Buying your first stock can be an overwhelming experience. There are thousands to choose from, and the financial media is saturated with hot stock tips. To help you cut through all that noise, here are seven basic things I always do when I analyze a stock. One of the simplest rules is to invest in companies you understand. This means that if you don't really understand how a hot new tech company generates its double-digit revenue growth, you could be left holding the bag when that growth suddenly stops. Therefore, an easy-to-understand stock which I often recommend is PepsiCo (NASDAQ:PEP), which owns a portfolio of 22 billion-dollar brands in sodas, teas, sports drinks, juices, and packaged foods that can be easily found in most supermarkets. The second step is to figure out where the company's revenue comes from. To do this, you should visit the company's investor relations website and read its latest quarterly reports. For example, a look at PepsiCo's latest report reveals that 34% of its 2016 revenues came from its North American Beverage business, 25% came from Frito-Lay North America, 4% came from Quaker Foods North America, and the rest came from its three overseas regions. We can also see that sales rose at the North American Beverage business, Frito-Lay North America, and Quaker, but declined at all three of its international segments due to macro challenges and currency headwinds. After measuring the weight of the company's business units on its top line, you need to understand how a company measures its revenue growth. Many companies will report a single figure for total sales growth, but an increasing number will report both "official" GAAP (generally accepted accounting principles) figures and non-GAAP ones -- which exclude "one time" charges like currency headwinds, stock-based compensation, acquisitions, divestments, and legal expenses. PepsiCo reported that its revenues fell 0.4% in 2016. However, its non-GAAP "organic" revenues rose 4%. Investors should take note of any glaring disparities between those two figures -- which may indicate that major ongoing expenses are being dismissed as one-time charges. The same rule applies to a company's earnings growth, which is often reported in both GAAP and non-GAAP metrics. For example, PepsiCo's GAAP earnings per share rose 19% last year. But on a non-GAAP "core" basis, which excluded some one-time gains, earnings rose 9%. Investors should note that Wall Street forecasts generally use non-GAAP estimates. Investors should then recognize and analyze a company's direct competitors. PepsiCo's closest competitor is Coca-Cola (NYSE:KO), but a closer look at both companies reveals fundamental differences in their businesses -- PepsiCo sells packaged foods, while Coca-Cola only sells beverages. Investors should also read a company's quarterly and annual SEC filings and carefully read the "Risk Factors" section -- which lists all the potential headwinds which could hurt its business. PepsiCo's latest 10-K filing reveals that shifts in consumer preferences, regulations on sodas, growing competition in packaged foods, unfavorable economic conditions overseas, higher material costs, and recalls could all throttle its growth. A company's free cash flow, defined as its operating cash flow minus capital expenditures, can be used for a wide variety of purposes. Rapidly growing companies generally invest that cash into expanding their operations. Mature companies usually return that cash to shareholders with buybacks and dividends. Buybacks reduce the number of outstanding shares, which reduces dilution and tightens up valuations. Consistent dividend growth can attract more long-term income investors. 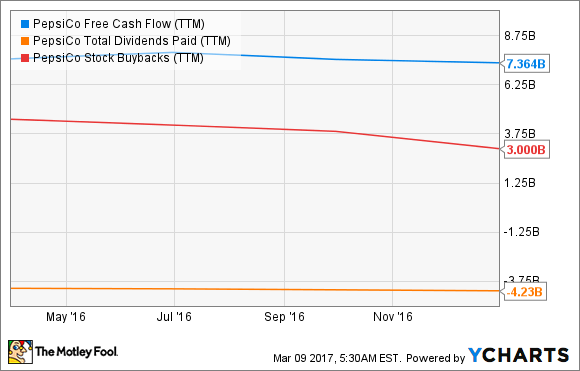 From the following chart, we can see that PepsiCo spent 98% of its FCF on dividends and buybacks -- which makes it a very shareholder-friendly company. The key metric for investors to watch is a stock's P/E ratio -- which is simply the stock price divided by the company's earnings per share (EPS) over the previous four quarters. If you only have $5,000 to invest, don't simply spend it all on a single stock, which places all your eggs in one basket. Instead, put $1,000 in five different stocks, preferably in different industries, to reduce your overall risk. Lastly, don't buy your entire position in a single stock all at once. Instead, gradually build a position over a period of several months or years to balance out your average purchase price. That strategy of "dollar-cost averaging" greatly reduces the risk of your first purchase.